It all started with a trip to Barnes and Noble. We hadn't been there in quite a while, so it seemed fun to get a cup of coffee and a treat of some sort while perusing magazines and books, one of which we might bring home. First I treated myself to a good look around the store. I love the journals, the art supplies, the desk accessories, the bright colors of everything. 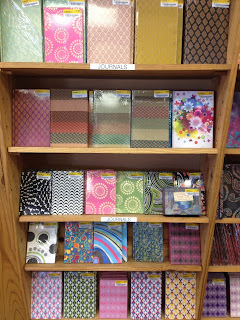 As I looked at the journals, picking one or two up and looking closer, then glancing with dismay at the price tags, I thought, "I could make these". 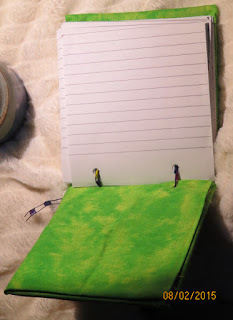 I realize that book binding is a whole craft/hobby in itself, so this will take some practice of different binding methods to find out which one is the best. You can cut your paper to fit, cover some cardboard pieces with decorative paper or material, make some holes, and, if you have ribbon, you can tie the whole thing together. This is what I did for my first try. 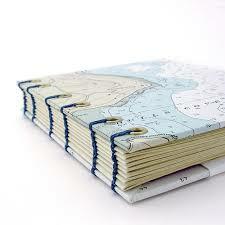 The next type of binding I want to try is more involved. 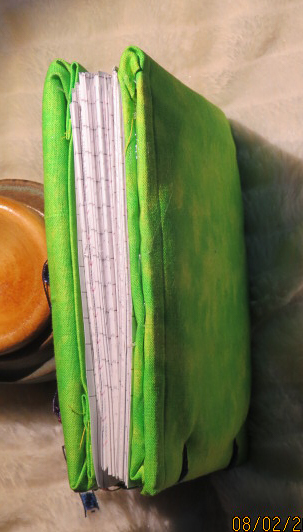 It is to take paper folded in half - several sheets to make a folio, say maybe eight sheets. 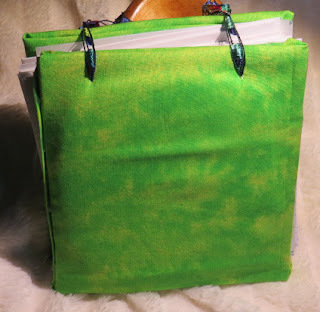 Gather 8 folios together, making 64 sheets, and then after cutting holes, sew the binding. 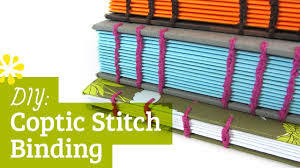 The best idea is to make 5 equidistant holes along the folded edge, and once the covers are prepared and corresponding holes are made in them, something called Coptic Stitching can be used to sew the binding. 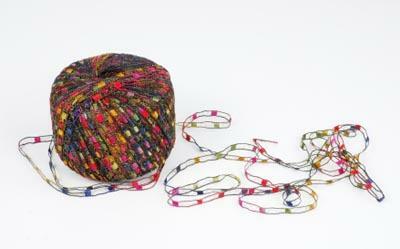 I'm wondering if I can incorporate my love of crochet into this somehow. 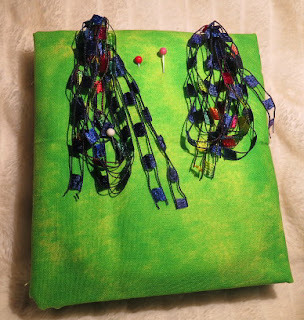 Coptic stitching looks like this which leads to this Youtube video tutorial. I bought a Grommet Kit today at Home Depot because I like the look of the grommets in the thick cardboard to the left. I'll have to see how they made those covers. To begin, I got out my stash of fat quarters. For those of you who don't quilt, fat quarters are precut pieces of fabric. They are each one quarter of a yard of material. 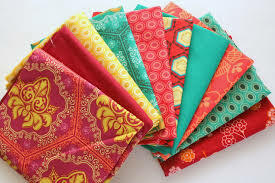 If you had one square yard of material, you could cut it into 4 fat quarters. Why the word, "fat" is added, I don't know, but it sounds much more fun than just plain old "quarters." Since I'm addicted to color, I have packages of fat quarters in rainbow colors, some of which are tie dyed. I just like to look at them. While I don't quilt at present, I use these quarters for making patches, for edging on jeans, whatever I might need a small amount of fabric for. I chose a lime green fat quarter and found 2 equal 5 1/2" X 5" pieces of thick cardboard from some Amazon package we had received, and proceeded to figure out a way to cover the cardboard with the fabric. 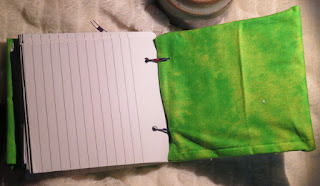 At first I tried to hot glue gun the whole thing, but I needed a hem around the edges, so I went to the sewing machine and 1/4" hemmed both fabric pieces. Lest you think I just whisked over to my sewing machine and whipped up the hem (which I should be able to do), I had to first learn that I needed the hem by burning 2 fingers and 1 shin with hot glue. The hot glue squirted out onto my shin (I was sitting cross legged on the floor) when I put a new glue stick in the back. Feeling the pain, I reached to get the burning stuff off and proceeded to burn the 2 fingers and the thumb I used for that. Once I started gluing fabric instead of myself, I realized I couldn't glue the hem under while holding the fabric without causing myself further injury, hence the sewn hems. I also pricked my finger on the sewing needle AND had to wind 2 bobbins because the first one kept getting all tangled up. It took way longer to make 2 simple hems than it should have, but I don't sew that often. Nothing daunted, I took my injured, bandaided self and the hemmed fabric back to work on covering the cardboard. Now that there was a neat edge, I had no trouble, although the corners are thicker than I'd like because I didn't cut away excess material. I happen to have a paper cutter, so I was able to take some lined paper I had and cut it to fit. I didn't take the time to really make it exact, so the edges of the paper aren't all even, but close enough. I remembered that I had brought home some of my father's tools as mementos - he had fine tools made in the USA back in the 30's to the 50's, amongst which were 2 awls. I used the awl with a hammer to punch holes through the cardboard first, and then the paper. 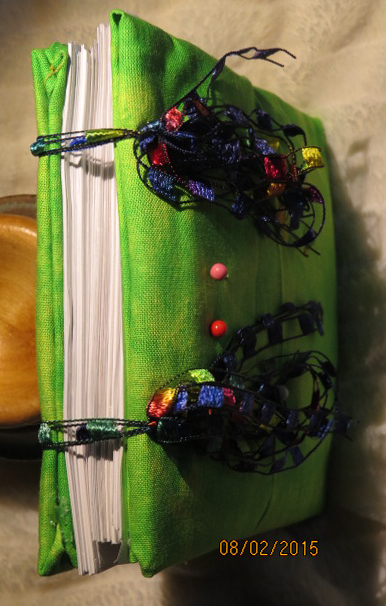 I threaded the needle with the ribbon and pulled off enough to make a long double strand, then I sewed the covers and paper together. I added a couple of push pins on the front so if I have a shopping list I can just pin it on the outside of the journal/booklet for ease of access. I'm pleased with the outcome, but I think the grommets would have been neater and perhaps metal rings would be nice, too. I will be experimenting to find what I like best.